How do I quickly and easily deploy a Java web application? Amazon Web Services (AWS) is a great platform for running Java workloads, and offers several options for deploying and managing both off-the-shelf and custom applications. When planning to deploy a Java web application to AWS for the first time, new customers are sometimes unclear as to which method will allow them to quickly get their application up and running. This document provides guidance for deploying Java web applications quickly and easily using either AWS-provided or self-managed IIS web servers. The following sections assume basic knowledge of Amazon Elastic Compute Cloud (Amazon EC2), Java application development, load balancing, and MySQL databases. Understand the deployment, installation, and configuration characteristics of the application. Understand application expectations from initial deployment to future scalability, availability, and backup and recovery requirements. Use automation whenever possible for deployment and other tasks where consistency is important. Leverage source code or application repositories to protect your application. AWS offers several tools and services to enable both AWS-managed and customer-managed Java application deployment. The table below is a high-level reference to help identify the most appropriate option for a specific scenario. The following sections describe these different approaches and their applicable use cases in more detail. Existing custom installers, application archive (JAR, WAR, ZIP), manual file copy, etc. Existing software deployment tools and processes or automated deployment services, such as AWS CodeDeploy or AWS OpsWorks. The AWS Toolkit for Eclipse provides the easiest and most straightforward way to deploy custom Java applications to AWS. This approach allows developers to deploy Java code directly to AWS, and to create supporting resources, such as AWS-managed RDS databases, directly from within Eclipse. 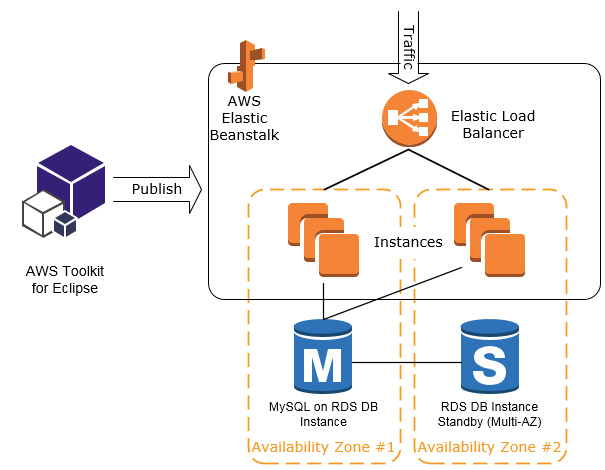 For production deployments, customers can use Eclipse to create Java Archive (JAR) or Web application ARchive (WAR) files that are then versioned and deployed through more controlled change management processes using the AWS Elastic Beanstalk (Elastic Beanstalk) console, Elastic Beanstalk Command Line Interface (EB CLI), or Elastic Beanstalk API calls. Applications packaged into a JAR, WAR, or ZIP file, then deployed with the Elastic Beanstalk console, EB CLI, or Elastic Beanstalk API calls. To deploy multiple applications to one Elastic Beanstalk environment, customers can bundle multiple WAR files into a single ZIP file. Amazon EC2 Windows instances allow customers to deploy Java applications to AWS using their existing application deployment tools and processes, or to integrate Java application deployment with automated deployment tools and services such as AWS CodeDeploy or AWS OpsWorks. AWS CodeDeploy and AWS OpsWorks make it easier to rapidly release new features, and automate the configuration, deployment, management and updates of your services and applications on both EC2 instances and on-premises servers. 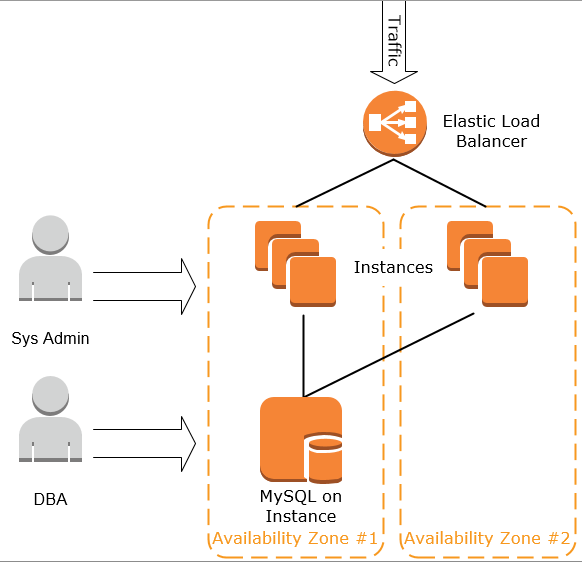 This approach offers tremendous flexibility, but also requires advanced AWS knowledge and service configuration, such as creating and configuring Elastic Load Balancing load balancers, Auto Scaling groups, and self-managing the Java platform and underlying OS as well as implementing custom application-deployment processes.